Raise your hand if you’ve ever wanted to customize Mr. Robot’s Best in Bags gear suggestion, even just a little bit? Mr. Robot understands that us humans can be particular about certain things, or prefer something because we like it better (a concept he is still trying to learn). He also knows that the way we play our characters, or the situation we find ourselves in, could mean an alternate gearing strategy ends up more helpful than the original one he found. You get it – you’ve been there. The latest feature lets you customize the mathematically best solution with things that you might like better. Combining math and feelings isn’t easy, but admittedly, it’s quite useful! Mr. Robot starts with your Best in Bags solution and then offers you alternatives, quantified so you can see the trade-off. This lets us think of gear not in the terms of one ultimate set, but instead as a cloud of top-performing sets. The idea is to give you the information you need to confidently choose your gear setup. If you refresh the page and don’t see the feature, it’s because the site is using your cached data. 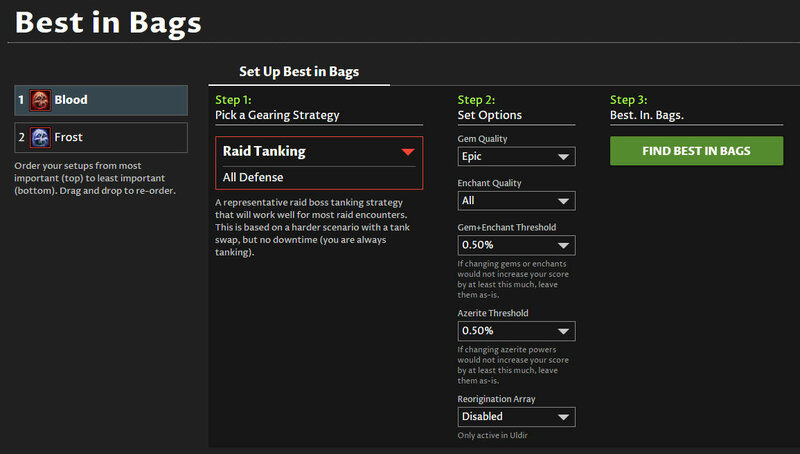 You can force it to update by re-importing your character, or change any setting on the Best in Bags setup screen. After running Best in Bags to get your optimized gear, you will now see a third tab after the results tab. Click on that to see a list of alternate setups that you could use. Each alternate favors a particular Azerite trait, stat, or both. Click on one, and Re-Optimize will light up. Press that to see your new result with those preferences in place. If you have a preference chosen, it will show above your gear table. When you get a bunch of new gear and do Best in Bags again, your preference will be remembered. Mr. Robot will continue to use your preference unless you tell him otherwise or the solution is no longer good enough (your score is too low compared to the original Best in Bags solution). To clear your preference, click the delete icon next to your preference (as seen in above screenshot). Or go back to the Customize tab, clear your preference, and pick a new one if you’d like. What does tier 1, 2 and 3 mean? Each alternate setup is assigned a tier. Tier 1: Nearly equal in value to the best possible set of gear in your bags. You probably won’t be able to notice the difference in-game, so confidently use whichever tier 1 setup you like the best. Tier 2: You might be able to see/feel a little loss in-game, but it won’t be enough to seriously impact your performance. You could still rank high and raid at the mythic level without compromising your team in any way. Other hard-to-measure factors could still make one of these setups the best for your personal situation. Tier 3: You will definitely feel a tad weaker with these setups in most cases. You would probably only want to pick one of these if you either really like playing it, or there is something very specific about your team or a boss fight that makes it work better for you. Why do we use tiers instead of showing you a list with specific scores like… 0.6% worse than the best setup, 1.1% worse than the best setup, etc.? To prevent undo bias against a particular setup. For example, say that one alternate setup is 0.1% worse than the best in bags solution, and another is 0.15% worse. If we put those in order and show those numbers, people are going to tend to pick the highest one. That’s just human nature. But those are so close to each other… nobody can definitively say which would perform better in-game. So we band them together in tiers to eliminate that bias and encourage people to try different setups. The idea is to help you feel confident picking anything within a tier because they are all so close to each other. We’ll keep an eye on this if it ends up not working out that well — it would be pretty complicated to come up with some kind of “threshold” that works in conjunction with these new preferences at the same time, but not impossible. Here are some details about how we choose the alternatives to show you, and how it picks the specific gear that it does for each alternative. How do we pick setups? We do not do it like this. Why not? Because the top 30 setups will usually be very small variations of each other. 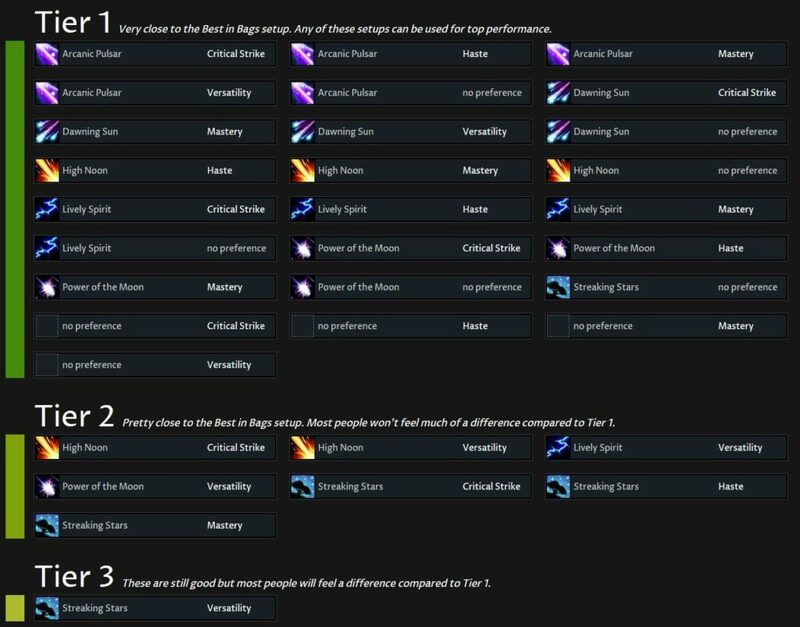 For example, the #2 setup would probably be the #1 setup with your wrist slot swapped out for an item that is the same item level with the same stats but in slightly different amounts. That’s not very interesting, and furthermore, those two setups would be so close in value that calling one of them #1 and the other #2 is kind of silly. You could use either one and never tell the difference in-game, both from a performance perspective (meters) and a gameplay perspective (how it feels to you). 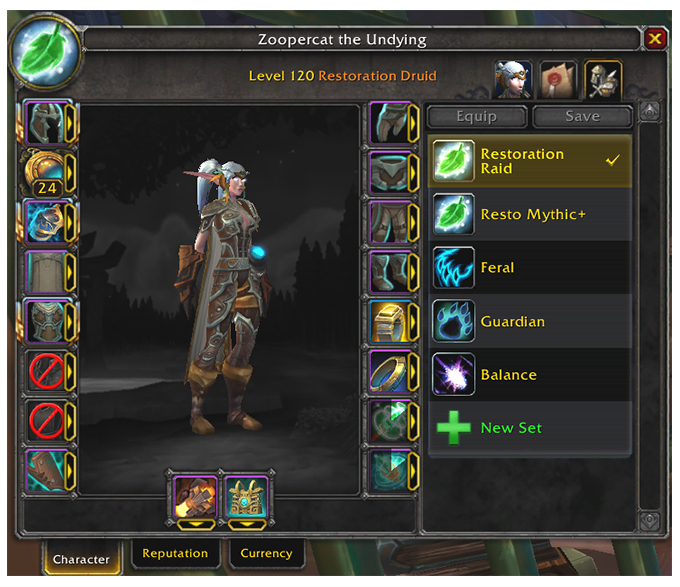 Our goal is to show you about 30 significantly different ways to gear — setups that favor different azerite powers to the extent that your gear allows, heavily favor particular stats to the extent that your gear allows, or a combination of the two. This gives you way more interesting choices than 30 slight variations of one set of gear. How do we pick the gear in each setup? Do a bunch of fancy statistics to turn the simulation data into a thing that can quickly and accurately score any combination of talents, stats, azerite, trinkets, etc. So now we want to find alternatives to the highest-scoring setup. Each of the alternatives represents a “preference” in the optimizer for a specific azerite trait, a specific stat, or both. This gets tricky because the optimizer can no longer rely on “highest score” alone — we have introduced some fairly complex constraints. Without getting bogged down in the computer programmer details of it: we find the highest-scoring set of gear that favors the preferred azerite trait and/or stat without being dumb. By “being dumb” I mean that we won’t put on an azerite item that is 60 item levels lower just to pick up an azerite trait. We use some heuristics to keep it reasonable. Same idea with stats — if your only ring with your favored stat is significantly lower item level than your best one, we won’t use it. There is no single “right” answer for these rules of thumb — you are making a trade off between score and how much of the trait/stat you want to get. “Score” is a pretty objective measure. “How much I like Critical Strike” though… can’t really be measured objectively. That said, we think that we’re using a pretty reasonable threshold. If you see any cases where you feel it should be going more or less aggressively for your preferences, please tell us! Besides being super convenient, a major goal with this customization feature is to dispel the myth that there is only one way to gear in World of Warcraft. This is a topic that warrants a longer discussion, but here’s the short version: for most specs, you could heavily favor completely different stats, or use completely different azerite powers, and still perform at the highest level — both on paper and in the real game. This has been proven both in-game (via combat logs, etc.) and out of the game (via simulators, calculations, etc.). It is challenging to present multiple choices to people in a clear way, and in a way that quantifies just how much damage/healing/toughness you might be trading off to get your preferences. But it is a challenge that we think is important to tackle. The game is just more fun if you have more choices, and can confidently make those choices. Best in Bags now allows for multiple setups per spec. That means your main spec can have a Raid setup and a Mythic+ setup (with different talents, too). Or anything you want, really. 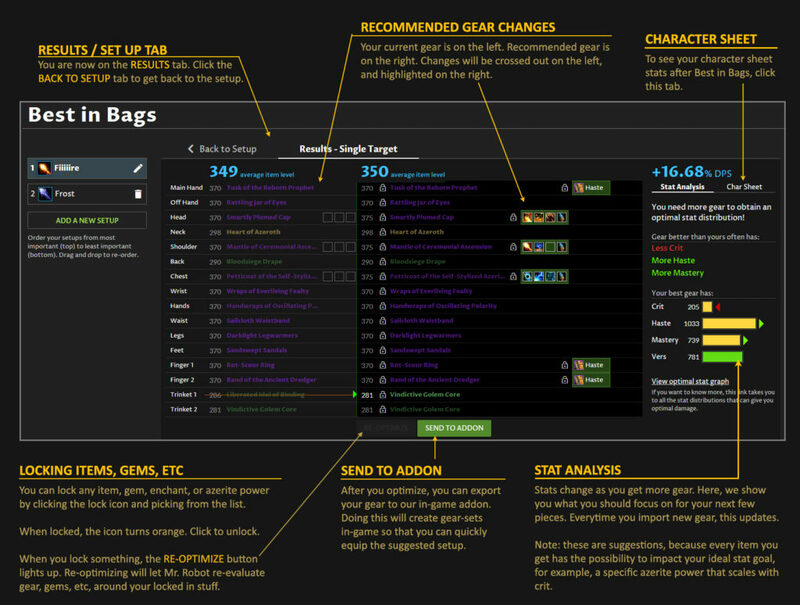 You must get addon version 65 or higher to use Best in Bags now. Mr. Robot isn’t trying to rain on your parade, I promise. He’s just really good at math, and breaking out legendary math-nerd skills at any party tends to be a buzzkill. You see, (pushes glasses up nose), if your Heart of Azeroth level isn’t high enough to unlock some powers on the higher iLevel item, it can be better to keep the lower one equipped. Mr. Robot compares the items based on simulations he’s done for you and figures out which is best, even if it seems counter-intuitive and ruins your day. But hey, it does more damage (or healing or tankiness), and it probably got some shelter puppies adopted too. So you can sleep well at night. 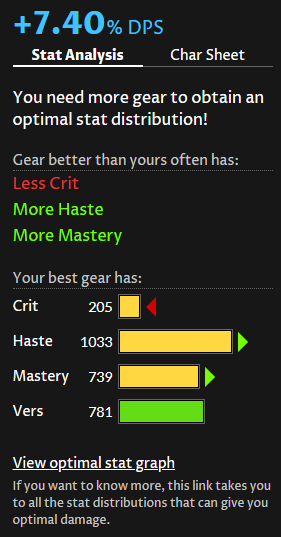 Today we released some major updates to the tank gear optimizer. We have a brand new Toughness Level feature that replaces The Blender, and several other tweaks to improve scoring across the board, but especially for lower item level characters. When you choose a tank gearing strategy on any of the optimizer features (Best in Bags, Gear Check, Best in Slot), you will see a Toughness Level slider below the list of Mr. Robot’s strategies. Simply drag the indicator to your desired toughness level, or click anywhere on the slider to move it. Press SET STRATEGY, then continue with your optimization. If you are killing 3 bosses in Uldir a week, you’re building up your Reorigination Array stacks. I’ll explain what this buff is and all of the details around how it works. Then I’ll jump into some ranking information to see how good it is for you. How does Reorigination Array work? The Reorigination Array is a buff that gets activated in Uldir. The buff adds 75 points to your highest secondary stat. So if Crit is your highest stat and you have 1,000 Crit. The Reorigination Array buff will bring your Crit up to 1,075. You need to meet a few conditions to activate it. Condition #1 : You must equip an Azerite item that drops from Uldir. Condition #2 : You must be able to unlock the outer ring of traits on that Azerite item. Condition #4 : You must also have killed 3 bosses in Uldir in a week, on any difficulty (including LFR). Doing this adds a permanent stack to the buff, up to a total of 10 stacks, for a total of 750 extra of your highest secondary stat. What is the best gear I can equip, from what I own? What are the best upgrades for me? Best in Bags answers that first question, and the “Find Upgrades” feature answers the second. And of course, we suggest Azerite Powers too! Best in Bags uses the power of simulators to recommend gear, without making you sim anything. We’ve already simulated it for you. As you’ve leveled up and been running some dungeons, you’ve accumulated a lot of gear. Is that titanforged item better, or should you use the one with the socket? What Azerite Power is better? Of my half-dozen trinkets, which two are best? While the answers to these questions are simple (here, this is your best set of gear!) – the process of getting to that answer is quite complex. You see… what if one Azerite Power is great, but only with a high-crit build? What if two trinkets interact really well, amplifying the effect of each other? The entire set of gear has to be evaluated in order to decide what is best. And there are a lot of combinations just sitting in your bags right now. If you had just 3 items per slot to choose from, that’s almost 5 million combinations of gear (which would be about 25 billion simulation iterations). You’d have to wait a long time for that simulation to finish! Mr. Robot solved this problem with Best in Bags. You click 1 button and get an answer in seconds. How is this possible?! First, we simulate all of the relevant combinations of gear, including trinkets and Azerite Powers, for your character. We do this over thousands of computers and it takes about 2 weeks to get through every spec. Then we store that in a database, so we can quickly look it up when you want to run Best in Bags. That lets Mr. Robot search through all of them with some fancy logic and machine learning, all so he can pick a best set in seconds. If you’re familiar with Best in Bags, you probably just need a resource to identify a few of the UI and functionality changes. Below are 2 images that explain the new UI. After that, I follow up with a few more in-depth sections. 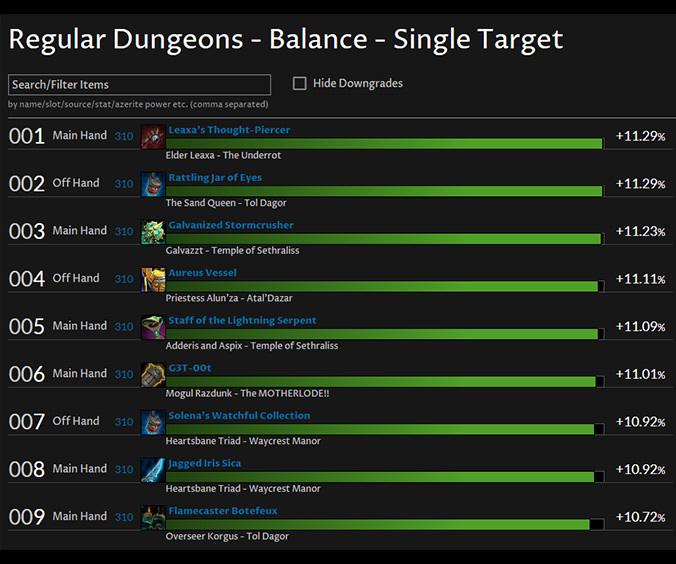 This new feature tells you what stats you should focus on for your next few items. Because we’ve simmed everything for you already, it replaces the need to sim your own stat weights. Now you can spend all of that time playing the game instead of simming the game. Learn more about how it all works on our Stat Analysis article. Pretend Haste is your best stat. Crit should be 80% of your Haste (so for every 100 Haste, you’d want 80 Crit). There’s an awesome Azerite Power that scales really well with Crit. So, what happens if you get a chest piece with that awesome Azerite Power that scales incredibly well with Crit? When you do Best in Bags, Mr. Robot checks all of your gear and sees if a high Crit build, paired with that Azerite Power, is better than the standard high-Haste build (in our pretend little example here). If so, he’ll suggest it. But because of this, there is no way for you to definitively say that one stat (Haste in this example) will always be best. But you know what we can do? Aggregate a metric-ton of data and give you a really high-probability suggestion of what stats you should focus on next. How does this work? First, recall that Mr. Robot has already simulated all of the necessary gear (and Azerite Power) combinations that you could get, and stored that in his database. So all he has to do is look up your current gear and then compare it to setups that do more damage (or healing or tanking) at your current iLevel. He then analyzes all of the stats in all of those setups and looks for trends. He might find that 85% of them have more Haste and less Mastery, in which case, he would tell you to focus on getting more Haste and less Mastery on your next few items. The advice shows up in this Stat Analysis section, followed by a graph. The graph shows the stats on your current Best in Bags gear, and the arrows tell you what to increase, decrease, and what should stay roughly the same. While 85% of setups might have more Haste, that doesn’t mean only high-Haste builds are going to be better for you. 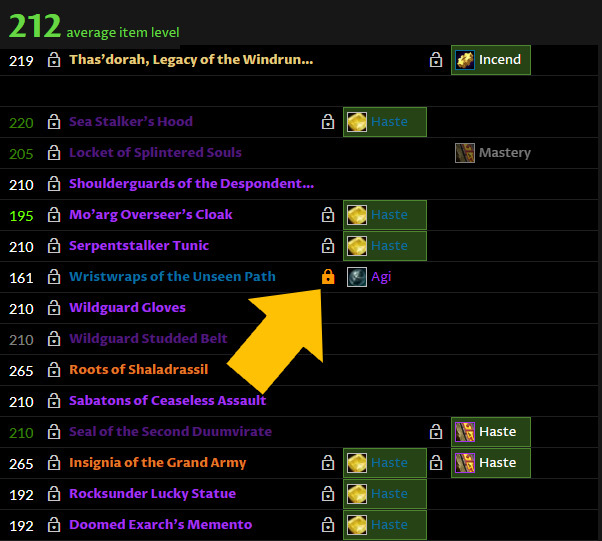 In this example, 15% of the better-than-your-current gear sets don’t have more Haste than you do now. You can also see a graph of the data Mr. Robot analyzed for you. This lets you see that, yep, a whole bunch of these are stacking Haste, but a few have relatively low Haste. Click the “View optimal stat graph” link to see the top performing stat distributions for your item level (or any item level). 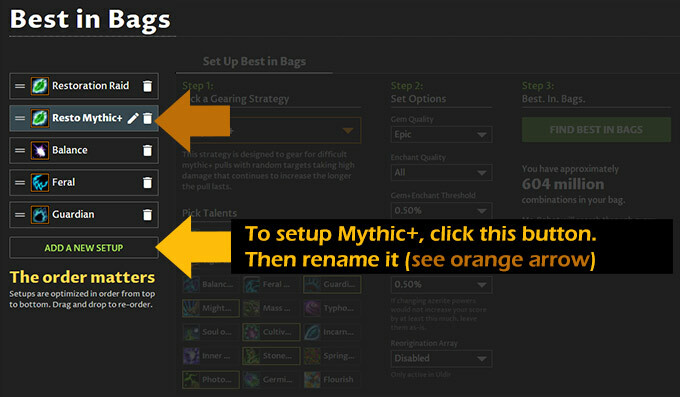 People often want to do different Best in Bags setups, so we’ve added in that functionality for BfA. For example: one for raiding and one for Mythic+. Or maybe you also want a second raid setup for bosses where you switch talents. 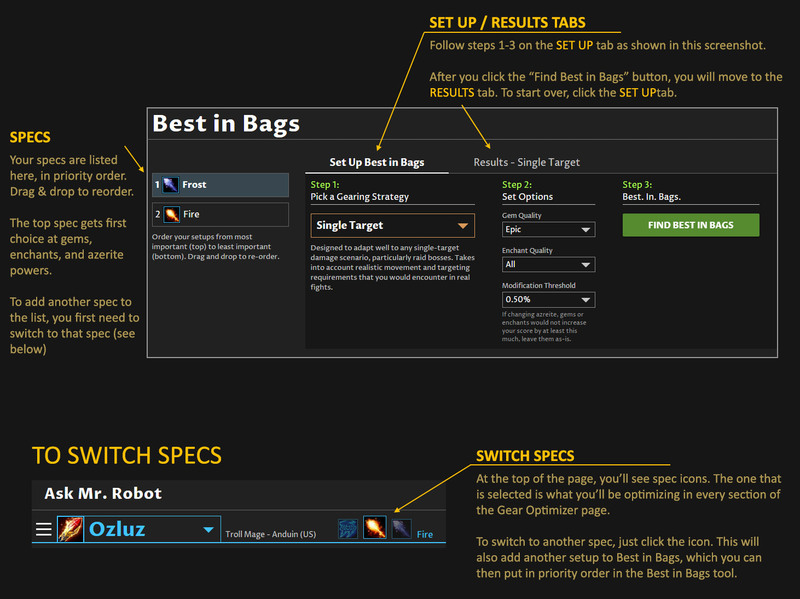 You can switch between any setup by clicking on one in the Setup List on the left side of the Best in Bags section. The addon has a dropdown menu now, to swap between your setups and specs. When you export your setups to the addon, all of them get exported. 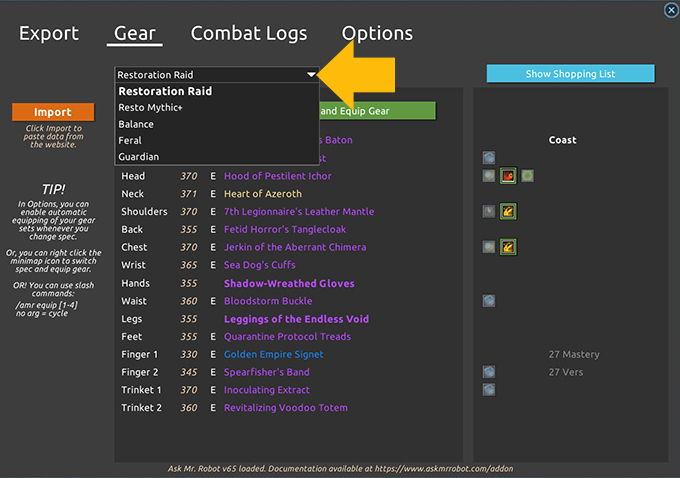 You can switch between them in the drop down menu at the top of the Gear tab. In-Game equipment manager – Ask Mr. 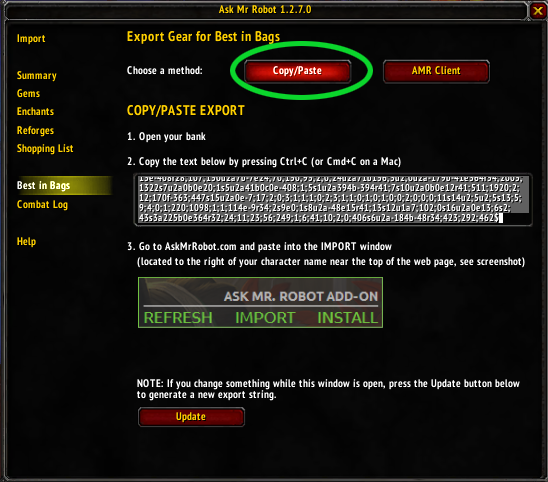 Robot addon exports right to it. Once you equip one of the setups, our addon also creates a gear set in the in-game equipment manager. For a more in-depth tutorial on creating multiple gear setups, check out this post. Sometimes, you just want to make sure Mr. Robot keeps your favorite trinket or Azerite Power and works around that. No problem! He’s happy to oblige. This is where locking comes into play. You could always lock items, gems, and enchants during Legion. But it was a power user feature that was hard to figure out on your own. Since locking things in is a big part of customizing your gear, we’ve put it front-and-center. Every lockable thing now has a lock icon next to it. Click the lock icon to bring up a list of items, gems, enchants, or Azerite Powers. Choose the one you want and it will lock in. If something is locked, the icon turns orange. Click it again to unlock. The Upgrade Finder gives gear suggestions for any content you want to do. For example, Mr. Robot will give you advice on what bosses you should use bonus rolls on. Or help you figure out what you can get in your Mythic+ cache (once it’s released). For now, dungeon and crafted sources will probably be the most helpful. Here’s a 1-minute video showing you some of the ranked lists and their customizable features. The video has no sound (no, your speakers aren’t broken). I will have a narrated, full video soon. Below the video are some screenshots. First, you’ll need to pick the Best in Bags setup that you want to do the search for. This is important because the upgrades are based on the best gear that you already own. When we launch multiple setups, you’ll also be able to pick one of those. 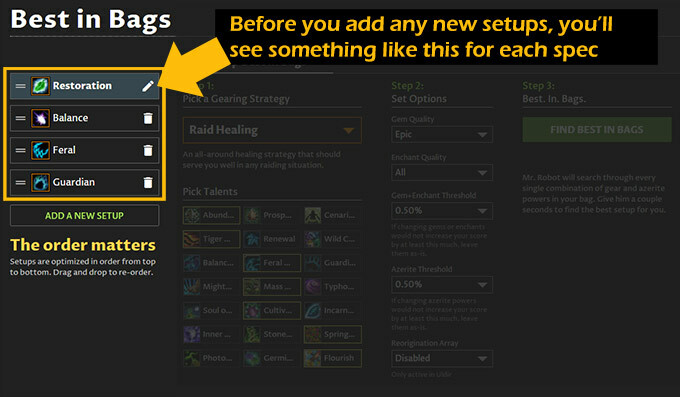 So you can find upgrades for your main spec, single target and a mythic+ set, all my choosing the setup on the left. The screenshot above shows that I have Best in Bags setups for Balance (my main spec, listed in the #1 spot), Feral, and Guardian. I also selected to find upgrades in Regular Dungeons, set to Normal difficulty. Here’s what the results look like for my not-quite-120 character. You can also search through this list to narrow it down. By slot (type Trinket or Legs into the search box. This Upgrade search gets some extra special features. Now let’s look at the results because it’s fun (and I have a couple things worth pointing out). Biggest Upgrade – ranks it by the biggest upgrade the boss drops. Highest Chance – ranks by the boss with the highest chance to give you an upgrade, regardless of the size of the upgrade. For example, if a boss has 5 drops that you could win and 4 are upgrades, you’d have an 80% chance that if you win a bonus role, the item would be an upgrade. If another boss has 2 drops that you could win and both are upgrades, you’d have a 100% chance of an item being an upgrade if you win the bonus roll. Weighted Average – it ranks by a combination of the two. Mr. Robot looks at the size of each upgrade the boss drops and the chance you’ll get an upgrade if you win the bonus roll. You can also expand any boss to see the items it drops and how big of an upgrade each one is (and you can also see how many are downgrades). You can click anywhere on the boss to expand the list (but I highlighted the expand arrow with a yellow circle, because if you see this anywhere on the site, it means you can expand it for more stuff). If you are already premium, a huge thanks. As a 3-person small business, we really appreciate every person who upgrades. We get to make this site as our ‘day jobs’ and that is only possible because of people like you. If you haven’t upgraded yet and like the features, Best in Bags and the Upgrade Finder save you a lot of time and give you really accurate gear advice based on simulations custom to you (that we’ve already done for you).. It’s $12 a year, or $2 if you want to pay monthly. You can upgrade here. Everyone gets a free trial (no credit card is required, because that is just trickery and we don’t do that). You might have used up your free trial in a previous expansion. If you would like it reset so you can try the features for BfA, use the contact form on the website and send us a message. I will personally reset your free trial. I know you’ll love the features and I want you to see them for yourself. I’m seeing a lot of questions about which gearing strategy to pick, so I wanted to give you a thorough explanation. We have four default strategies for DPS to pick (tanks and healers, I’m getting to you). Single Target: Based on Garothi (see boss script details), and good for single target fights with mostly T20 and T21 gear. Recommended for Garothi, Felhounds, Imonar, Kin’garoth, Varmathras, The Coven, Aggramar, and Argus. Multi-Target: Based on Mythic+ with higher gear, and good for T20 and T21 gear. Recommended for Mythic+, Antoran High Command, Portal Keeper, and Eonar. Pre-T21 Single Target: Based on Goroth and good for single target fights with mostly T19 or T20 gear. Pre-T21 Multi-Target: Based on Mythic+, good for AoE fights with mostly T19 or T20 gear. Tanks have a whole bunch of new ones (see, we love tanks! ): Raid Boss Low Level, Raid Boss Heroic, Raid Boss Mythic, and Mythic+ for 16-20, and 20+. As of writing this, all tanks are done except Blood DKs, which should finish by the end of the day, 12/15. Healers are up next and we HOPE to have them all finished by Dec 19th. 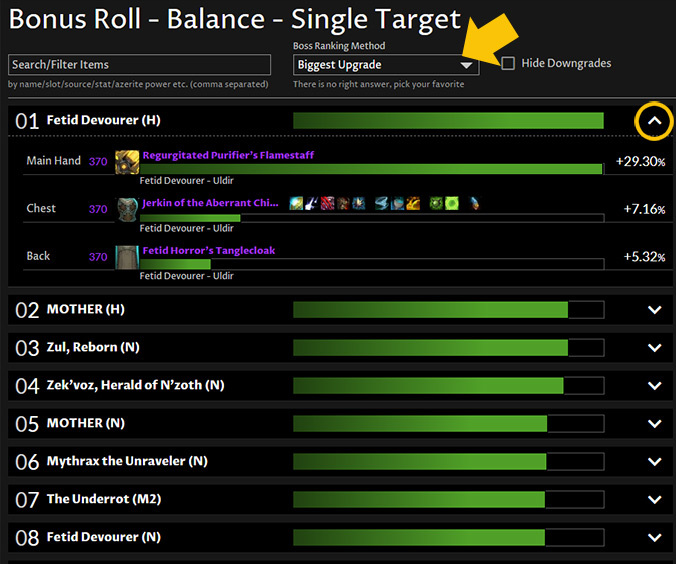 Most of you probably had Pre-T21 Single Target selected when Antorus came out, which was good because you had mostly T20 gear, maybe even some T19 bonuses carefully balanced in there with your T20 4pc. If you are getting T21 pieces now, you will want to switch to the Single Target strategy. The order I listed them above is the order they are on the Gearing Strategy drop down menu. So to select it, you will have to scroll UP (that has caused people to miss it, and I am sorry about that). You might be wondering, if these auto-adapt as your gear changes, why have two different strategies? Wouldn’t it make sense to put them all in one? The number of combinations explooooodes. If you want to include all gear combos with T19 (and relevant iLevel gear), T20, and T21, it gets a bit insane. It is also not necessary to look at those combos because it is very, very, veeeery unlikely someone has such a strange gear selection that they would want some T19 iLevel stuff, T20, AND T21. That means you won only 2 items for each slot, ever. In reality, you will span two tiers. For example, right now you probably have a lot of T20 and some T21. If we limit the combinations to a cross over between two tiers, it is giant, but manageable. And since we run every relevant combo for those two tiers (and all of the talents and relic combos you might have as well), being a manageable size is important. It lets us finish up all of the gearing strategies in a week, instead of a month. Wondering what adaptive gearing strategies are? I explain what they are and why they are a necessary update to the old stat weight systems people have used in the past (us included). With the realm merges, you may have noticed some characters won’t load on our site. That’s because they also won’t load on the battle.net armory. If they don’t load on battle.net, we can’t load them automatically either (since we get the data from battle.net. 1. Open the Ask Mr. Robot addon in game. 3. Copy the text in the box on that screen. NOTE whenever your gear changes, click the “Update” button at the bottom of that window first, THEN copy the text from the box. 4. Return to AskMrRobot.com. Click the green “Import” button to the right of your character name. 5. A window will open up. Paste the text in the white box. 6. Click the orange “Import” button at the bottom of that window. Your character now has updated gear, talents and glyphs. If you want to get that data into SimC, click the ‘export to SimC’ button found just above your stats section on our site. Grab the code and paste it into SimC.